Broncos Owner Pat Bowlen was elected as the newest member of the team’s Ring of Fame in 2015 – his 32nd season with the franchise. One of two owners and one of just three non-players elected to the Ring of Fame, Mr. Bowlen has guided the Broncos to an unprecedented period of success during his three-plus decades in Denver. The only owner in NFL history to achieve 300 overall victories during his first 30 seasons, Mr. Bowlen has totaled the most regular-season wins (313), overall wins (334), winning seasons (20) and playoff appearances (18) among his colleagues since he purchased the team in 1984. The Broncos are the only NFL team to post at least 90 wins in each of the last three decades while posting the fewest losing seasons (5) during that span. Mr. Bowlen’s seven Super Bowl appearances are tied for first all-time among NFL owners. The Broncos’ back-to-back titles in 1997 and ‘98, along with Denver’s Super Bowl 50 win in 2015, make him one of just seven owners in history with at least three World Championships. Denver’s success and recognition nationally was confirmed by a 2014 Harris poll that named the Broncos “America’s Team.” Locally, the Broncos have oper- ated with the best homefield advantage in the NFL during Mr. Bowlen’s ownership, ranking first in the league in home winning percentage (.732 / 202-74). The team also has sold out every regular season and playoff contest as part of the team’s NFL-record 379-game sellout streak dating back to 1970. In addition to his unmistakable impact with the Denver Broncos, Mr. Bowlen has had a profound influence on the growth of the NFL. He has served on nine league committees during his ownership, helping negotiate record-breaking television contracts and ensuring years of labor peace with several extensions to the NFL’s Collective Bargaining Agreement. 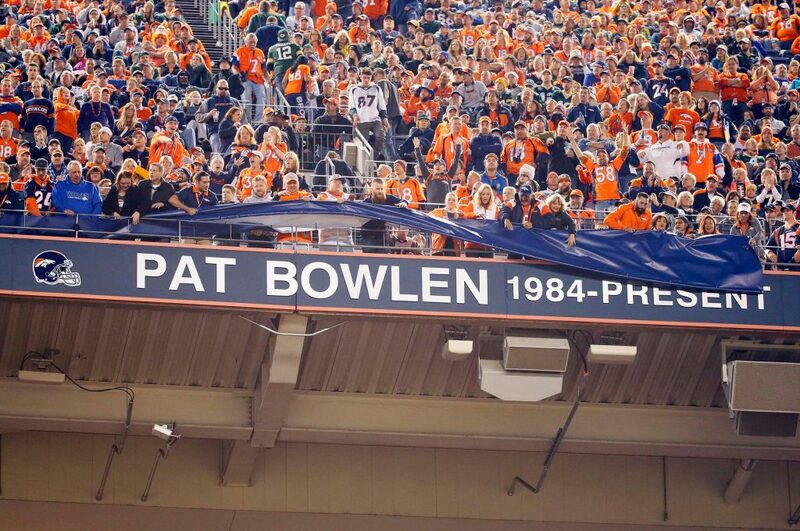 Mr. Bowlen’s championship mentali- ty – to be “No. 1 in everything” – includes an unwavering commitment to the community. As chairman of the board of Denver Broncos Charities, he has donated more than $25 million to charitable organizations in the Denver area since the inception of that fund in 1993. Pat Bowlen earned degrees in both business (1965) and law (1968) from the University of Oklahoma. After successful careers in oil, gas and real estate, he purchased the Denver Broncos in 1984.